You both did so well, Kitty! Everything is just perfectly Halloween! Your witch is such fun, as is the towel you so cleverly stitched. I can well imagine Cissy was very popular when she went home. Those red velvet cupcakes look delicious. Yum! Good I am sure! 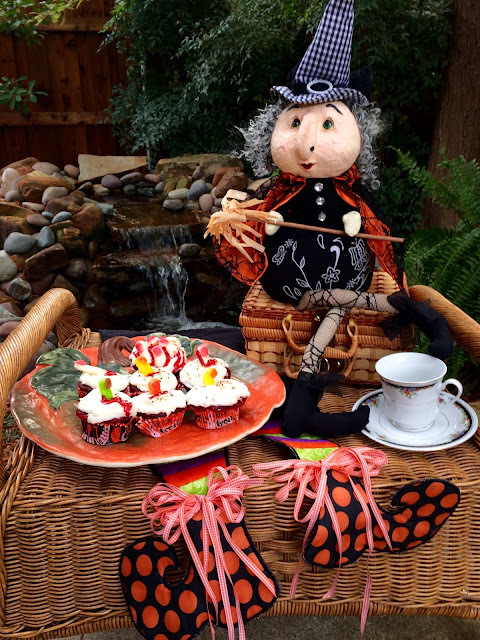 These are so cute, I know she had a ball making these spooky treats! Your witch vignette is adorable Kitty! I hope Cissy left you a cupcake or 2! Cissy is such a sweetheart! I imagine the whole family awaits her return home with more goodies. Thank you for sharing another sweet post. Have a lovely week, dear Kitty. Hi Kitty, so sorry about this morning. 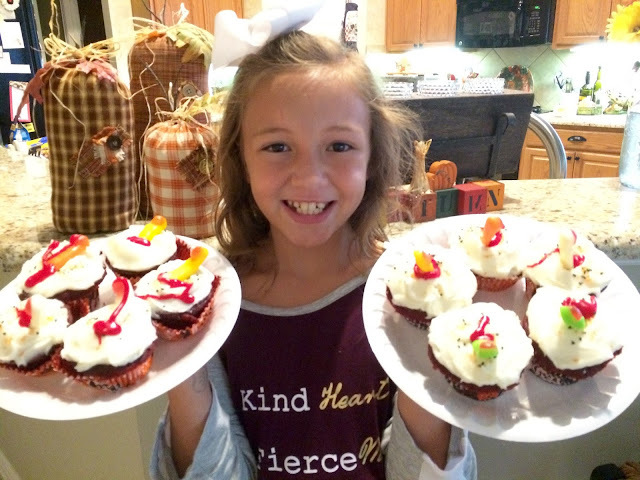 Cissy looks so cute and i know she has so much fun with you making cupcakes. We love red velvet cupcakes here with the frosting. Thanks for sharing this at C&C with J&J. Have a wonderful week. Your creepy cupcakes get two thumbs up from me! Too cute! I've never heard of gummy fingers before. Bwahahaha... and the cupcakes must have been so delicious! Oh, how adorable! So thankful you have such fun with dear Cissy! God bless you and your dear family, my friend. Praying for you. Very cute! That towel is adorable! Cissy looks like she enjoyed her special time with you again! Oh, what a darling towel...well done! 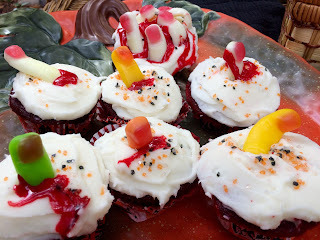 And scary or not, I just bet those cupcakes weren't too scary to eat! That is the cutest towel ever! Oh those cupcakes look so yummy! You and Cissy have the best time together. I think your family must have an extra creative gene that skipped my ancestors! Cissy's smile just lights up my ♥ & Mike's creations are creepy enough to be fun without being gross. 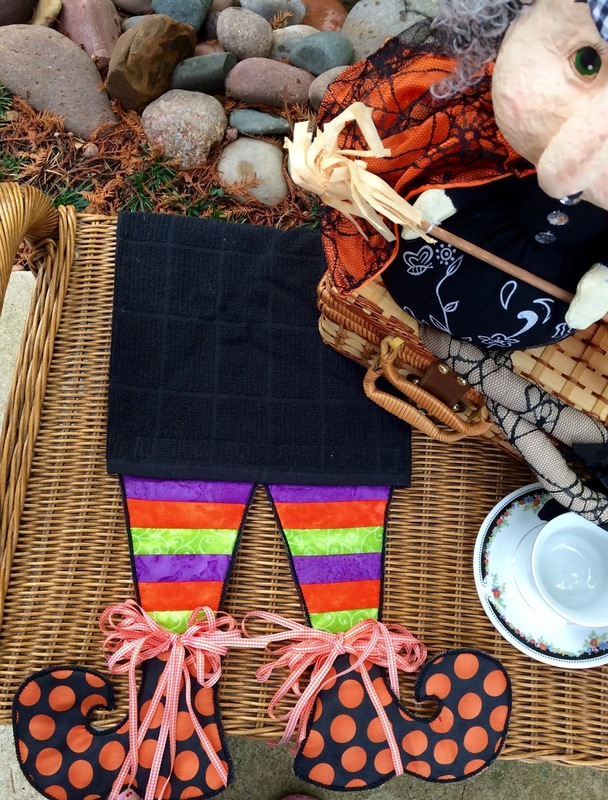 The set up is really festive & I Love your little towel with witchy legs!! Kitty, I'm sure Cissy is loved everywhere she goes - even empty-handed! I'd love a little spoonful of that frosting right now, just by itself! Gummy fingers? Hadn’t seen those out in the stores! So cool for Halloween! Hi Kitty, I make this cream cheese frosting and I love it! Thanks for sharing with SYC. What a fun cupcake project for you and Cissy, she is such a precious girl! Hope you stay warm and dry while enjoying the little spooks tomorrow night! Thanks so much for sharing your post with us at Full Plate Thursday! Have a great week and come back to see us real soon! Cissy is having a blast with her Nana. She is quite the baker and so creative. Cream cheese frosting is the best! black magic removal specialist My friend mentioned to me your blog, so I thought I’d read it for myself. Very interesting insights, will be back for more!